Rum Run Goes International! (Contest Winners Announced) Rum Run Is Done! Like Really Done! Like Seriously, For At Least A Long While! Yikes! Three months without an update… how embarrassing. But that’s not to say there isn’t plenty going on. Here’s the news I’m motivated to print: Remember Shima? That double-edition game Dan King of Reluctant Pirate Games and I worked on together about a year ago? Well, nothing’s happened with that. But like Shima, Dan and I recently collaborated on yet another game for yet another TGC contest. 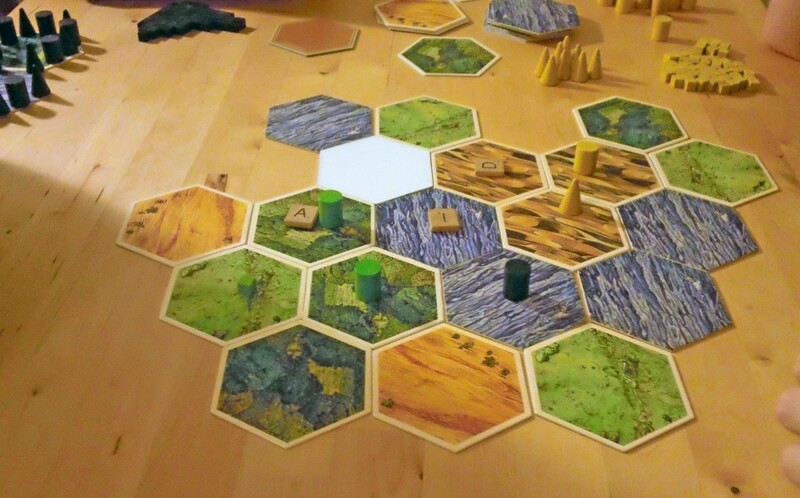 We call it: Terra Neo, and HOORAYITSAFINALISTINTHISCONTEST! Which frankly, is pretty impressive considering there were nearly 50 entries this time around. Here’s a quick walkthrough of creation: The game started with Dan and I brainstorming ideas specific to the theme of the contest: map-building. We thought about different reasons why a map might be dynamic, and the very first thing that came to my mind was god pawns that move around a void creating land adjacent to them. 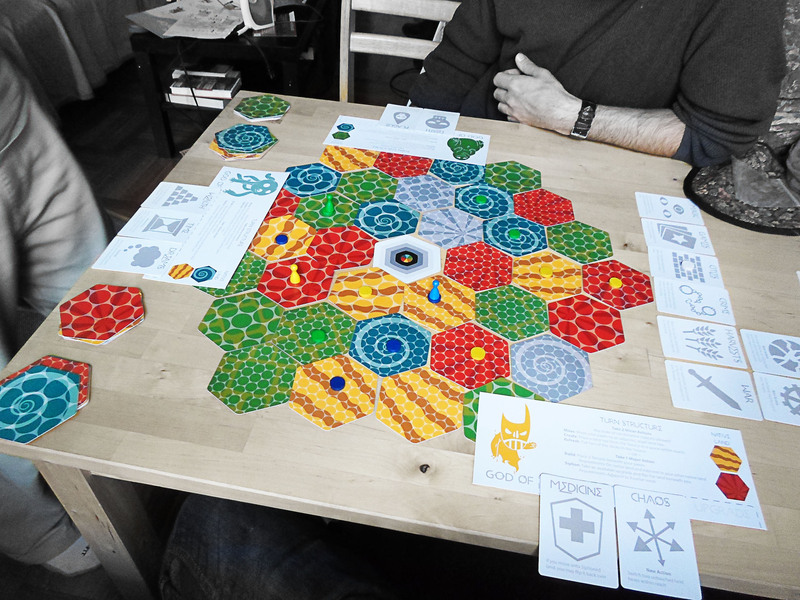 Dan liked it, so from there we played with various ideas of how to score points and advance in the game, eventually settling on creating temples in your god’s honor. We started with an idea that there would be three ‘levels’ of temples that could be created based on the adjacent land, but eventually decided it was cleaner to have only one requirement for building temples, but that the temple’s value would change based on its adjacencies. That version of the game on its own provided a fair amount of strategy, but considering this was a game about gods, we couldn’t stand to deny players the chance to achieve and utilize various powers. 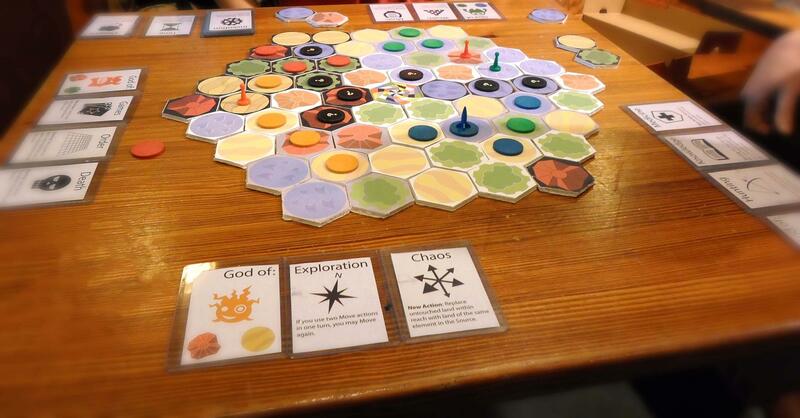 Our next step was brainstorming upgrades: things like, ‘swap tiles adjacent to you’ or ‘push players out of your way’. And then, similar to Puerto Rico, we decided to include upgrades that increase your final score at the end, things like ‘earn extra points for every adjacent native land’ or ‘your temples do not count toward the score of others’. 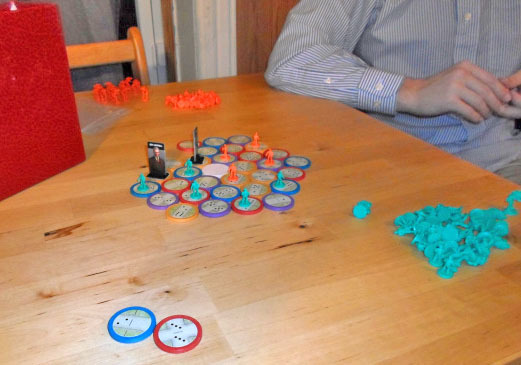 There was some tinkering and fine tuning, but eventually we settled on a set we were pretty happy with that fit into the $25 cost limit of the game. Fun fact: Dan has created a super-useful Excel file that allowed us to quickly and easily change the number of components/cards/whatever in the game and see the final cost changes reflected. Another concept test using Catan and Scrabble Tiles. A for Alex, D for Dan, I for Ian. And we used one shape for each ‘level’ of temple. Oh, we also had some debates about the name of the game. The working title was ‘New Pantheon’, but despite it’s literal meaning, it just sounded too Greek to me, and we wanted our world and gods to stand on their own. After sending Dan a list of about 40 suggestions of alternatives, we settled on ‘Terra Neo”, which translates to “New Land”. Cool. Dan covered most of the artwork on this version of the game (with help from his friend Cameron Rockwood and color design by the ever-reliant Morgan Shaw), and I mostly worked as a sounding board while charetting work on the rules in the last week before the deadline (I was also busy pumping out endless renders for another contest). But now we’ve made it, we’re finalists, and I’m pretty thrilled with the result. Dan and I make a good team. Our first prototype, painstakingly cut from foam core and tested on a willing sample. And yet, I wouldn’t be me if I wasn’t working on a deluxe version, and this coming edition of Terra Neo will use smaller tiles, have more players, more upgrades, and adjust some of the rules and design elements to align more closely to my tastes. Obviously, it will be more expensive. For some more intense breakdowns of Terra Neo and its development, see Dan’s recent posts here, here and here.